What exactly is China up to in Africa? … In Africa, we found that China had lent at least $95.5 billion between 2000 and 2015. That’s a lot of debt. Yet by and large, the Chinese loans in our database were performing a useful service: financing Africa’s serious infrastructure gap. On a continent where over 600 million Africans have no access to electricity, 40 percent of the Chinese loans paid for power generation and transmission. Another 30 percent went to modernizing Africa’s crumbling transport infrastructure. … the total amount of land actually acquired by Chinese firms was only about 240,000 hectares: 4 percent of the reported amount. I like to remind my students of the qualitative difference of the “Chinese model” of resource exploitation in Africa. Previously, Exxon, Elf and other Western resource sector firms would pay African leaders in cash, most of which wound up in Swiss banks, property in southern France, and various tax havens outside the Continent. This was, if you will, the “Western model” of resource exploitation in Africa. Enter the Chinese. Their model is to pay for resources both in cash and in kind. African leaders still get cash that they can stash abroad. But they also get roads, railways, stadia, hospitals, water works, among other infrastructure investments. And more recently Chinese firms have begun to invest in actual factories — most notably in Ethiopia. It is no wonder that a majority of Africans have a favorable view of China (see image). Some of these projects produced sub-standard structures (in the recent past the quality has gone up). And the level of indebtedness of African states as a result should concern every sane person. But this arrangement is orders of magnitude better than useless capacity building workshops and janus-faced democracy promotion on the back of rapacious pillaging with little public investments to show for it. Finally, the inability of African states to negotiate reasonable deals with Beijing is on African political and economic elites. The Chinese have every right to rationally push for the best deals they can get. And if they are smart, they will also work to avoid future defaults by not overstepping their bounds. To paraphrase a Mozambican diplomat at a recent event here on campus, Africans are too smart to allow themselves to be recolonized by the Chinese. 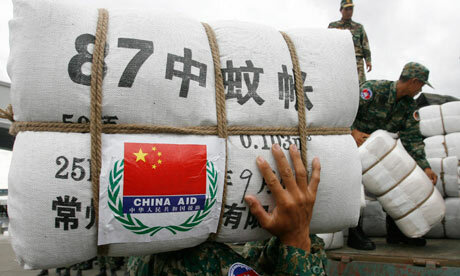 How does Chinese aid interact with level of democracy in poor countries? It is a commonly accepted idea in IR theory that states have the habit of externalizing their domestic institutions [and accompanying economic and political systems] in their engagements within the international system (See Katzenstein, 1976 [pdf, gated]) – think democracy promotion, Reagan-Thatcherist free market evangelism, or Sino-Russian coziness with states that have an authoritarian bend. So does the effect of Chinese aid/finance to poorer countries follow this pattern? In other words, does the institutional incongruence effect also hold for autocratic donors? …… we estimate the relationship between Chinese development finance and human development in democratic and autocratic recipient countries. Our results show a negative relationship between Chinese development finance and human development in democratic countries. Interestingly, these results also suggest that Chinese development finance can successfully promote HDI growth for autocratic recipients. Kosack found the opposite pattern in his study of Western aid. The findings are preliminary and may not withstand robustness checks, but all the same interesting. Also, check out the Economist for a neat analysis of the potential impact of a Chinese economic slowdown on African economies.